Certainly, the gift of cat art will delight any cat lover. Whether you're looking for a gift for yourself or for that special cat lover in your life, you've come to the right place. Here you'll find tips, ideas, and suggestions to help you choose the perfect gift of feline art. Luckily, there are many options to choose from: from inexpensive cat posters to cat paintings, and from sophisticated cat prints to whimsical cat statues. There is something unique to please almost every taste. These are only a few of the gift ideas you'll find here. Below you will find more suggestions. And you will also find interesting information about cat-inspired art. Throughout history, cats have been a favorite subject matter for many artists. Cats have inspired painters, sculptors, and writers. Indeed, cats' presence in art has been thoroughly chronicled in books, documentaries, and magazines. Here's some information I've found about cats in art. 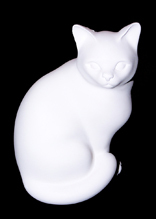 Sometime ago, I was looking for a unique cat gift for one of my friends, and I came across a beautiful statue of an Egyptian goddess in the shape of a cat. After doing some research, I found out that the sculpture was a depiction of the Egyptian goddess Bast, also known as Bastet. Bast was believed to be the protector of Pharaoh. Check out these pictures of the cat goddess Bastet. I also learned that Ancient Egyptians held cats in high regard. One of the roles cats played was that of protector. Indeed, Ancient Egyptians used domestic cats to protect their grain from rodents. Cats were also believed to have supernatural powers. At that time, cats were mummified and buried with their owners. Cats were so highly regarded that people who killed cats were sentenced to death. During those ancient times, priests would keep a cat in the temple. Many believed that such a cat was the incarnation of Bast. Cats were indeed very popular during those days, as the ancient artifacts that have been discovered suggest. Indeed, many statues, figurines and other depictions of cats have been found in Egyptian archaeological sites. One of the best-known statues of Ancient Egypt, the Great Sphinx, is also another example of the Ancient Egyptians' admiration of felines. It's one of the wonders of antiquity that survives to this day. Certainly, Egyptian-cat art makes a great gift for cat lovers who also love Egyptian art and history. Cats were also highly regarded in Ancient Asia. My dear friend Dalia (who loves both cats and astrology with the same passion) told me that the cat is one of the animals of the Vietnamese Zodiac. Curiously, the cat doesn't appear in the Chinese Zodiac. The Incas also immortalized felines through drawings and figurines. The Incas worshiped the jaguar and the ocelot (a beautiful feline native to South America). Both the jaguar and the ocelot appear in Ancient South-American artifacts. Check out this picture gallery for feline art ideas. A few feline-inspired artifacts dating back to the middle ages have been found. Christian art of the time, however, did not depict cats in a positive light as early Christians associated cats with evil. Cats also appeared on several paintings during the renaissance. Albrecht Durer's Saint Jerome portrays a big cat lazily sitting behind Saint Jerome. Titian, Raphael, and Leonardo Da Vinci also painted and/or drew cats. For more information about feline paintings, visit our page about paintings of cats . Cats, big and small, kept on appearing on many works of art throughout the 17th, 18th, 19th, and the 20th centuries. One of the biggest exponents of the Baroque style of the 17th century was the Flemish artist Paul Reubens. His Peace and War shows a big cat (maybe a leopard) amidst the action. During the 18th century, artists Alexandre-François Desportes, William Hogarth, and Francisco de Goya painted cats. Cats were also portrayed in many Japanese paintings during the 19th century, including Kuniyoshi's Cat and Goldfish. During this century, European artists also showcased cats in several paintings, including Renoir's Julie Manet with Cat, Vallotton's Laziness, and Manet's Woman with Cat. The 20th century also left us beautiful paintings of cats. Chagall's Paris Through the Window (1913) is a wonderful example. Other artists who also depicted cats in their works include Pablo Picasso, Andy Warhol, and Pierre Bonnard. Here are more cats in art. Again, cats' beautiful shape and mysterious behavior have inspired artists, writers and musicians in many parts of the world. Even today we find cats as a recurring theme in books, paintings, posters, movies, and even musical theater. The Cheshire Cat, who appears in Alice's Adventures in Wonderland (by Lewis Carroll), is one the best known literary cats. And even though this book was written in the 19th century, this character remains very popular. In fact, this whimsical story even made it to the movies. In musical theater, Andrew Lloyd Webber's Cats! was one of the longest running shows on Broadway. Indeed, cat art is especially popular this day. You see it everywhere. Cats are found in calendars, cartoons, movies, music, and clothes. You have many options to choose from! By the way, cat cartoons are very popular and many people enjoy collecting cartoon memorabilia. Cat cartoon related items make a unique gift for your cat loving friends who also love collecting. Nowadays, cats are one of the most popular domestic pets and it is no wonder that their popularity is reflected in art. Rachel Parker is a contemporary watercolor artist who paints cats. You can visit her studio at here. 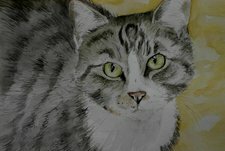 Her cat paintings make great gifts for cat lovers. Another artist specializing in animal paintings is Mia Lane. Mia Lane knows her animals well, and has been painting them for over 40 years. She has a collection of beautiful cat prints as well as prints of dogs, cows, horses and wildlife. Her cat paintings will absolutely delight any cat lover. To see her great animal paintings, you may visit her site http://www.mialane.on.ca/. Maria Angela Reyes, Colombian artist and cat lover, will do a portrait of your cat by commission. Her site www.mariangelareyes.com has all the information you need. And while you're there, check her beautiful cat paintings. And finally, for a fun cat art gift check the absolutely wonderful prints featuring the best-dressed cat in America: Lorenzo the Cat. What a cool cat! For more gift ideas, check these feline-inspired paintings. When searching for the perfect gift of cat art, you need to consider several factors. For example, how much do you want to spend? Does the gift recipient prefer a style or art technique over another? If you want to spend a little more, there are great online art galleries where you can obtain beautiful pieces of fine cat art. Cat prints: You can find cat prints to please almost every cat lover. Cat paintings make a lovely gift for both art and cat lovers. Fantasy cat art has grown in popularity and you can find pieces to satisfy most tastes. Abstract cat-themed art is another unique alternative. Check out the work of artist Irina Zhychuk at estetka.com. Once you're there, select English and go to the gallery. These cats make great cat gifts. Chinese feline art combines the beauty of cats with the exquisite elements of Chinese art. Statues and sculptures of cats. You will find pieces for both the indoors and the outdoors. Gifts using cat-inspired photography - You will find photographs to please any taste: humorous, inspirational, black and white, and much more. Unique cat drawings - The works of Louis Wain are a great option, but there's lots more. Cat wall art - From metal wall art to wall sculpture, you will find a piece that will wow your cat loving friend. Art showcasing anthropomorphic cats - You will find a wide selection: cat cartoons, prints, and posters - to name a few. Cat portraits are very popular these days. This is a wonderful way to capture your pets' beauty for posterity. Cat cartoon art is also very popular and you can find a wide variety of options. Books about cat art make a great cat lover gift. A good option is Why Cats Paint: A Theory of Feline Aesthetics by Heather Busch and Burton Silver. Vintage cat art is an especially great idea for those who enjoy collecting vintage posters, for example. 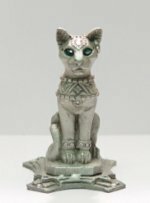 If you want to give a gift that's out of the ordinary you can give a cat statue (like the one depicting Bast) or antique cat collectibles. For those of your friends who own both cats and dogs, consider dog and cat-art. You don't have to break the bank to give a unique gift. There are several options that fit any budget. cat posters make an affordable choice. you can also find cat-art posters and reproductions of famous works at reasonable prices. here are additional posters of cats. Cats the Musical. You can give the DVD and/or a CD of the soundtrack. The Aristocats. This is a classic for all ages. You can give the movie DVD and/or a soundtrack CD. For a more irreverent gift, why not give a CD of the world famous Jingle Cats? For a more personalized touch, you can make the gift yourself! For example, if your friend has a cat, you can take a picture of your friend's cat and put it in a nice frame. You can find frames that go from the whimsical to the modern. There's something for everyone. Another idea is to create a collage of different cat pictures or create a custom-made calendar using cat pictures. You get the idea. You can really get creative! A gift of cat art is an excellent idea for any occasion. Whether the occasion is a birthday, graduation, or any other milestone, cat art makes a unique gift. If, however, picking the gift yourself is a little difficult, you can always give a gift certificate. Many online stores offer this option. Take into account the particular taste of the gift recipient before selecting your gift of cat art. Does your friend prefer classical works or does she like modern art? If you plan on giving a painting, drawing or print, keep in mind that there is a wide selection of techniques. Techniques and mediums include: watercolor, oil on canvas, charcoal, acrylic, lithography and screenprint, to name a few. For a truly unique gift also consider: whimsical statues, metal sculptures, and yard art!